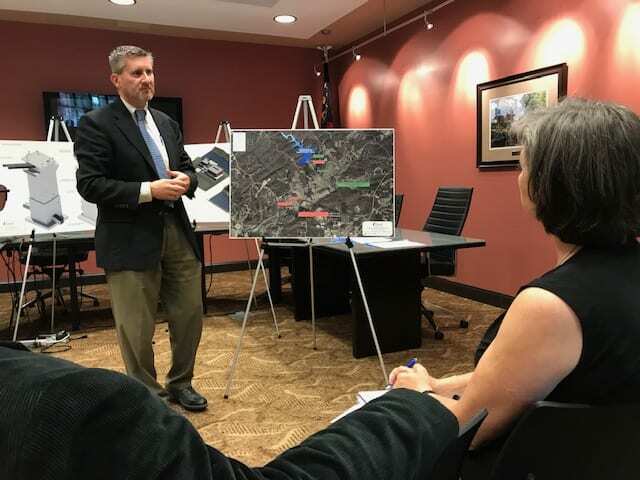 DAWSONVILLE, Ga. – The Etowah Water and Sewer Authority (EWSA) held an information meeting to share plans with the community for the $40 million Russell Creek Reservoir, which is expected to reach buildout by 2023. The Authority finally received a 404 permit from the U.S. Army Corps of Engineers last July and EWSA Director Brooke Anderson was eager to talk about the 110-foot tall embankment dam and spillway system that will be located between Etowah River and Seed Tick roads. Once completed, Anderson said, the reservoir which will be 700 feet long, 700 feet wide and 110 feet deep. It will cover 137 acres, hold 1.2 billion gallons of water and be capable of serving 126,000 people, which is the county’s projected population in 50 years. Water to fill the reservoir will be drawn from the Etowah River, which is controlled by the Corps of Engineers. Golder, a global consulting, design and construction company, was selected to design and build the project. The original plan called for construction of a second water intake pump to be installed in the river to pull water out through a 24-inch pipeline to fill the reservoir. “But the engineers came up with a much better, much more environmentally sensitive solution,” Anderson said. Anderson said Golder will be constructing a new spillway for the dam that will be equipped with gates located at different levels that will help to protect aquatic species. Additional information meetings will be held in May and June but no dates have been set.